The 2017 Fullcourt Press Spring League continued play this past Sunday (March 19th) at Artesia High School (Lakewood CA). Selected games were again live-streamed by Baller.tvand all games were video-taped by MOSLive.com. Those first two reports featured league standouts. This report will highlight several more as well as others who continue to play at a high level. Very promising young post forward has a great combination of length and scoring skills. This was the first time I had seen Todd since before he averaged an impressive 18.3 points and 11.2 rebounds per game during his recently concluded freshman season and man was I impressed with the progress he has made since last year! High games this past HS season were 31 points/19 boards vs. Oxnard and 31 points/13 rebs against Oaks Christian. 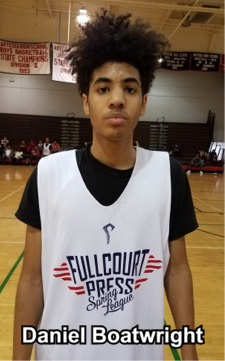 Benjamin has soft hands that allow him to catch the rock on the block despite defensive resistance and has real ability to score in the pant - both with his back to the basket as well as utilizing a very effective mid-range face-up jump shot. Being a superb passer also adds to his value as an offensive weapon. Solid rebounder and defender too. As he continues to settle into his body and add strength, Todd projects to have the potential to be a Top 25 national prospect in 2020. HS coach is former Villanova star and NBA forward Tim Thomas. Great kid and “A” student. This versatile lefty forward continues to grow on me! Styleof play reminds me of Rondae Jefferson (Arizona/NBA). Woods is impressive attacking defenders off the bounce and his improved pull-up jump shot that extends to the 3-point arc gives him an added offensive dimension. Long arms and quickness gives him the potential to also be a lock-down defender. Excellent student with silky 3-point stroke has ability to put up big numbers. Can also attack the cup and finish if defenders crowd him at the 3-point line. Drawing Pac-12, Mountain West and WCC interest. Phillips continues to improve and impress every time he sets foot on the court. Quick on his toes, Josh has the athleticism and timing to be a legitimate shot-blocker and is excellent at rebounding outside of his space. Offensive skills are coming along as well. 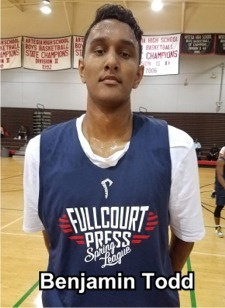 By the end of July, Phillips could very well be a sought-after West Coast PF recruit. Defender-deluxe exhibited a newly refined jump shot last Sunday – connecting for several 3’s in each of the league games he played in. Top student (4.0 GPA) should be in demand by high academic programs this spring and summer. Tough forward has a scorer’s mentality and can do so in a variety of ways. Has the type of chiseled body that will allow him to compete physically in high-major conferences coast to coast. Up and coming sharp-shooting forward has sprouted several inches recently and his growth spurt shows no sign of letting up. One to keep an eye on! Athletic slashing scorer is dangerous in transition. Plans on transferring to Paraclete HS next season. Big wing scorer with a terrific 3-point shot. Love his confidence! Dad Greg played at UConn. Strong and very athletic lead guard is explosive to the cup. Jordan plans on spending next year as a post-grad 5th year prep. High-scoring guard is quick off his 1st step. Athletic wing with nice length can finish at the rim. Excellent upside. Strong PG can score off the bounce. Jack-of-all-trades wing is strong and can finish through contact. Long young wing with plenty of skills and upside. Burly PF is active on the glass and can score on the block. Very good (“A”) student too! Smooth WG with scoring punch. Savvy combo-guard with range on his perimeter shot. Wide-body power forward is a rugged rebounder. Very quick ballhandler is a pesky defender and underrated perimeter shooter. Heady PG with nice passing skills. Strong wing is a nice slashing scorer. 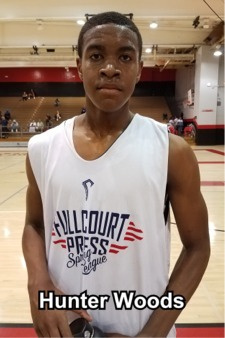 * Third of four reports about the 2017 Fullcourt Press Spring League.